As it’s been nearly two years(!) since I have written anything of substance I am a little ropey and out of practice. Furthermore as many deeds, sagas and quests have passed by during this long interval, how best to report upon them? I know not, so apologies if this is a bit of a meandering ramble but that’s just the way it’s gonna be! The past two years have been a hugely varied initiation into the life of a Freelance Art Person. I have been involved in huge mural painting projects, dabbled in web design, built gallery shows, painted my first solo murals, built structures for a festival, moonlighted as a carpentry assistant, painted window displays and made over the top mystical objects, among many other little nuggets of creative joy. Central to this an attempt to maintain a kind of idealistic flexibility: never immediately rejecting a job based on its category, trying always to be truly up for anything. I am yet to discover whether this limits the progression of a ‘career’ in one direction or whether this is just the pattern of how things always must be. The most interesting development has been a return to my favourite theme: mythology, symbolism and the nature of belief. During my hazy and chequered, art student past I once made absurd, brightly-coloured video art of a shamanic, symbolic sort. The subsequent rejection of which created a decade-long aversion to this type of work which I now consider a great shame. Older now and hopefully wiser, certainly more thorough and better-read, I have begun to make work again that explores this area of my interest. Chief among these to date is the Technicolour Dream Chair. A reclaimed rocking chair adorned with glyphs and symbols, all deeply personally signigficant or failing that, funny. Behold its awesome power! In all seriousness though I think it’s hard to overstate the importance of storytelling to human lives. We are entirely creatures of stories, so fundamental to everything we do; every goal, job, family, enmity, policy, conversation or romance is, wholly or in part, a fabrication of our incessant need to narrativise the world. I was lucky enought to see Carlo Rovelli, Italian physicist and eclectic thinker, in a panel discussion a couple of years ago and his fascinating exploration of this aspect of human nature really resonated. Looking through this lens the old, resilient, archetypical stories have a greater weight or significance and thus greater potential usefulness to individuals today. One should always turn a slightly sceptical eye towards anything claiming to be the ‘wisdom of the ancients’, but the oldest myths and stories were part entertainment, more importantly part guide how to be a better human. How we conceptualise the unknown and integrate the horror of the mysterium tremendum is how we become functioning beings – what could be more important!? It is this element that fascinates me and I hope to make work that combines this exploration of serious things with a light-hearted silliness – my preferred method of fending off the creatures of the dark! Onward marches my continuing obsession with growing plants and tending my small, dark garden. North London is neither the worst nor the best place to try and till the land: cities clearly haven’t got amazing air or soil and London especially has a bizarre, heavy-aired micro-climate that seems to stifle everything. But nevertheless it is still possible to achieve some horticultural victories. My chief enemy is as ever the enormous walnut tree next door (whichever past genius thought planting that in a terrace garden was a good idea I have no idea – colossal face-palm), though beautiful, it both shades and poisons everything around it. So my experiments have always to contend with that leafy elephant in the garden. Hardy shrubs and wild flowers yay! Decent vegetables nay! Saying this we have had some successes, the increasingly hot summers though worrying in one, major, climate-changey sense also mean my tomatoes are better every year. These princes of the garden are my great love and definitely get the best treatment (bubble wrap in the snow was the most luxurious intervention of 2018), and the fact we do them in bags down the sheltered side of the house, rather than exposed and in the ground, is key to their outdoor success without a greenhouse. Armed with memberships to the RHS and Kew gardens I am trying my best to learn as much as possible about plants as I really believe gardening improves both myself and the world even if it is only slightly. In any case, an increased awareness of the cyclic quality of nature, combined with my developing interest in native pagan stories has led me to consider the new year we celebrate in January to be premature. The year obviously begins when things start to grow again in the spring and a celebration at this time was natural for many cultures in ancient times. Even as recently as 300 years ago in our own: Lady Day, on the 25th March, was the official New Year in England for over half a century until the adoption of the Gregorian calendar in 1752. I propose a move back to this pattern as one small way of connecting us better with the planet we inhabit. In the three months since I bid farewell to my little shop I have not been idle (not completely...). Having resolved to forge a new and more independent career I have been working on a new website and generally attempting to solidify what exactly it is I'm offering. I am pleased to announce that this is now complete and I can with some trepidation present my brand new website and officially launch my freelance efforts! This site is far simpler than my current personal one; the work here is too broad in scope without much focus (a neat metaphor for my life :/), and I needed something with a clearer view towards what I intend to do professionally. I've also felt for a while that the increasingly scatterbrained nature of my blog posts could be confusing and should be separated from my work if possible. What I have decided to focus on is the less corporate end of brand design, the window displays I was doing at King's Cross having convinced me that glass painting is something there should be more of in the London, nay the world! So: window art, logo design, other graphic design, print media, web content etc. etc. anything really that helps tie the various elements of a business together into a coherent whole. And decidedly not the very formal kind of corporate branding - something I have had a bit to do with in my last job - and something I find extra tedious. Should anybody have any critical feedback I would hugely appreciate it, don't hold back the bile - I can take it. Even more importantly, please pass this vital information to anyone you know who might want a window or any other branding project doing. Obviously as I am now a pure, mercenary force of capitalistic drive and villainous, Scrooge-McDuck-esque moneymaking! Contact deets are all there, links are present on this site, everything I think is in place. If you need me I'll be hawking my wares round our nation's capital. Four years ago, when I moved into my current house , I had never done a serious day's gardening in my life. Sure, I had begrudgingly helped my mum do some weeding long, long ago in the mists of time, but my heart was never in it and when I thought about my priorities in life I never considered I'd have the inclination. In retrospect the signs were all there. A meticulous (some say obsessive) attention to detail, a love of nature and a general scientific appreciation of plants, and scores of relatives who had all found the green in their soul. All it took, it appears, was having my own space to experiment. In our North London house, shared between five similarly rootless creatives, we have been extraordinarily lucky. In contrast to many of the horror stories you tend to hear of drab city living, we have a large garden out the back, easily the same ground area as the Victorian terraced house itself. Upon moving in we found this a long-neglected wilderness, the landlord's recent intensive felling of tree and bush had created a mountain of debris that we were informed was our responsibility to clear and the soil was in appalling condition. Nevertheless something drew me to that miserable space and the first beginnings of the idea emerged that I wanted to improve it. Since the first tentative steps in the spring of 2013 this has become an ever-increasing labour of love. At first I knew nothing at all of the care of plants, or what works where, or timing and I still fall very short. However, much as Socrates claimed his only wisdom was to be aware of his own ignorance, I have learnt a great deal but now I begin to see just how much more there is to know. I am hooked! I intend to put down in writing some of these lessons from our earthy toils and to share a few pictures, mainly as an exercise in clarifying my prose style. 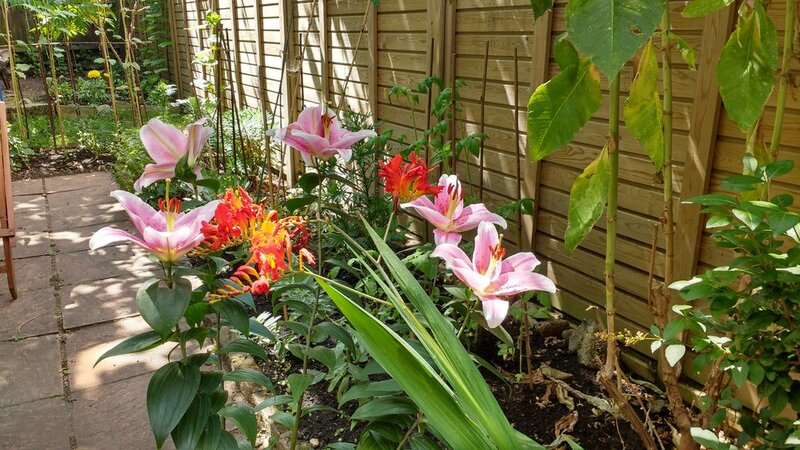 But also I am starting to feel that gardening is one of life's greatest joys, and I truly believe caring for plants is a hugely therapeutic process that all could benefit from in some way. So much of it can happen indoors that you don't really need a garden, if you are lucky enough to have any outdoor space then there is so much potential. I have begun to appreciate that it is in the process rather than the outcome that you improve yourself and it makes me so happy. If I can impart even a fraction of that to other people then I think it's worth doing.